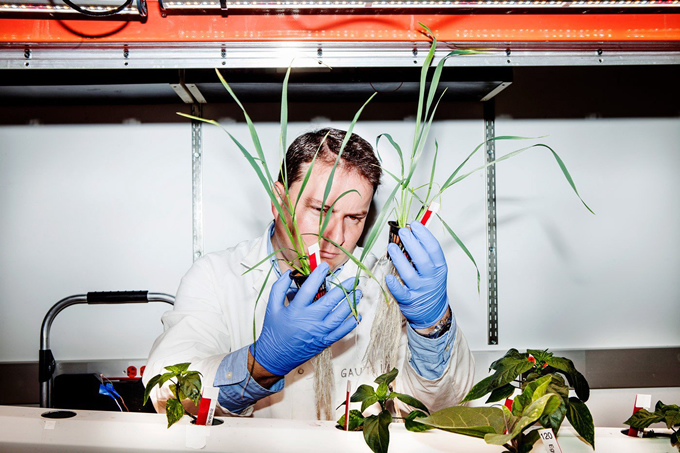 Corby Kummer for Nova: Paul Gauthier, a plant physiologist at Princeton University, took a short drive up the New Jersey Turnpike to try to figure out whether the biggest vertical farm on the East Coast is succeeding. The answer isn’t as clear as you might think. AeroFarms, which runs a 70,000 square-foot operation in Newark, is one of the highest-profile companies founded on the premise that growing crops indoors will transform agriculture. These aeroponic indoor farms stack leafy greens and herbs on racks that nurture the produce with sprays of mist and light from LEDs or high-pressure sodium lamps. They use no soil or pesticides, and can operate year-round. For further efficiency, AeroFarms mechanizes the seeding, harvesting, packaging, and cleaning of its produce. It requires a great deal of electricity to give plants the light and heat they could get for free outdoors. But the idea is that vertical farms in big urban centers will be less costly—both economically and for the environment—because of the inputs they avoid, like toxic chemicals and long-distance transportation to consumers. So do they actually come out ahead? Gauthier studies the science and the economics of growing food indoors, and he wants it to work. But the indoor farms getting glamour-puss investments refuse to release their numbers. And after touring several of them, digging into their methods to weigh the costs and the benefits, Gauthier is suspicious about whether the numbers add up. Feeding 10 billion people in a world stressed by the rapidly changing climate is going to require constant innovations in how food is produced—a new green revolution, just this time not involving methods that wreck soil and water. But while vertical farms might work as a technical concept, thriving as businesses is another matter.